Dem’ Golden Slippers is a performance and installation inspired by the street vendors and self-employed peddlers originally housed in the Essex Street Market. 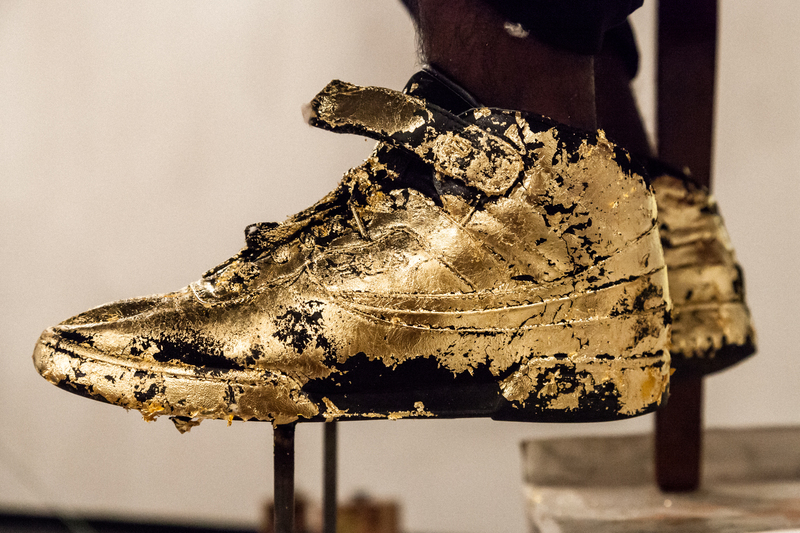 The exhibition explores the shoe shining trade and act of hustling that once energized the Market by setting up shop in Cuchifritos Gallery and inviting visitors to have their shoes gold-leafed. The title of and actions performed in the exhibition are influenced by minstrel lyrics that speak of putting your best things away until judgment. The work investigates the role of shoes as status symbol in the urban context, elevating the role of the shoe shiner as the provider of a tool for ascension. Justin Randolph Thompson’s work seeks to deepen the discussions around cultural and racial stratification and hierarchical organization by outlining a complex, hybrid and non-linear connection to history and sociopolitical discourse. The work is rooted in a multi-disciplinary approach that is as faceted in the mediums employed as in the array of art historical, literary and folk tradition references. Interested in engaging in non traditional venues, questioning the social implications of theatre space and developing work dependent on a collaboration with performers from a range of disciplines, ages and cultural backgrounds, his work encompasses sculptural installation, performance, video and sound. Reflecting upon the socially constructed communal legacy, he examines expectations and shortcomings through the absence of a concrete linear foundation. Justin Randolph Thompson is a sculptor and new media artist born in Peekskill, NY in ’79. Living between Italy and the US since 2001, he has exhibited internationally and participated in numerous residencies in the US and in Europe. A recent recipient of the 2013 Emerging Artist Fellowship at Socrates Sculpture Park, a Foundation for Contemporary Art Emergency Grant, the Open Studio Fellowship at Franconia Sculpture Park, a past Jerome Fellow and a resident at the Taller of Jannis Kounellis at the Fundacion Marcelino Botin in Santander, Spain, Thompson has had a recent solo project at the Blue Star Contemporary Art Museum in San Antonio and has forth coming solo projects in New York City, Corpus Christi and Barcelona as well as a forthcoming screening at the Whitney Museum of American Art. Stefanie Nelson is the Artistic Director of Stefanie Nelson dancegroup, a New York City based contemporary movement based performance group, and the Founder and Director of DANCE ITALIA, an internationally renowned summer dance intensive for contemporary dancers in Lucca, Italy. Ms. Nelson has been an Artist-in-Residence at the Baryshnikov Arts Center, The Yard, Dance New Amsterdam, and Florence Dance Center; her work has been presented in Canada, Mexico, Italy and the US at venues, which include Lincoln Center Out-of-Doors, Jacob’s Pillow, La Mama, Fabbrica Europa (ITALY), and Joe’s Pub. Jason R. Thompson is a third generation jazz musician from Peekskill, NY. He began his professional saxophone career in 1996 when he gave up a scholarship to the University of Tennessee and started a six-year stint on the road with Knoxville-based, nine member rock/R&B group Gran Torino. The group toured nationally, made several recordings, and enjoyed some college radio success before disbanding. Thompson returned to the UTK to study jazz under many great professors including Jerry Coker, and Donald Brown. Thompson’s choice of the baritone saxophone as his main voice puts him in a smaller circle of the saxophone family, but it’s his bass saxophone playing that makes him truly unique. He recently founded the band Frog and Toad’s Dixie Quartet. Thompson performs and composes regularly. Bradly Dever Treadaway is a Brooklyn based artist and teacher utilizing photography, video, film and installation to emphasize socially conscious themes and self-awareness. His work revolves around the loss of family, tradition and history and aspires to reunite present and past through visual metaphors. Treadaway is an internationally exhibited and published artist, a Fulbright Scholar to Italy and a Faculty member at The International Center of Photography in New York City.